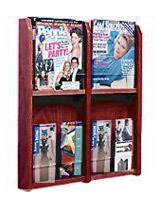 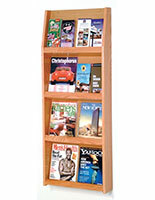 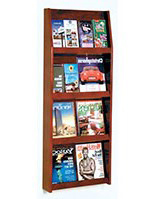 This 4 pocket flyer display showcases a magazine collection or set of pamphlets for business or travel purposes. 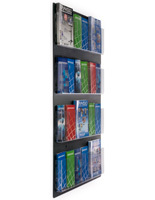 The adjustable design allows a four or eight pockets presentation depending on where the plastic pegs are set. 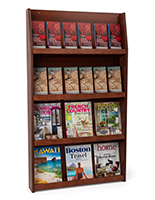 This 4 pocket flyer display, newsletter holder, mounts on the wall of a library, community center, or professional office to keep floors and counters free. 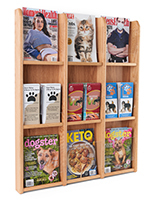 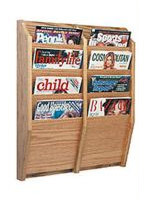 This 4 pocket flyer display that is a literature racks system has a beautiful wooden finish in solid oak that will last for many years. 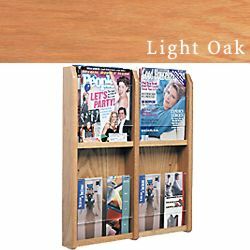 22.5" x 24.0" x 1.5"